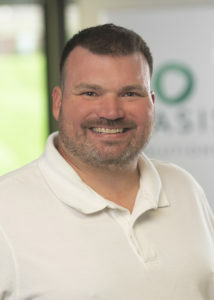 Oasis Solutions announced today that Scottie Blackmon has joined the company as Senior Consultant. Oasis Solutions is an award-winning business management software partner for Sage, NetSuite, and Adaptive Insights. “Oasis is pleased to announce the addition of Scottie Blackmon to our growing Sage consulting team. Scottie brings several years of consulting and technical software experience with Sage software. Scottie will be a real asset to our customers with his very consultative approach,” President and Co-Founder, Annette Manias. Scottie has a wealth of technical knowledge, from working in IT for ten years as a network/systems administrator to running his own recycling business. He has experience in Sage 100 implementations, installations, setups and troubleshooting, as well as FAS, KnowledgeSync, Crystal Reports and Sage Intelligence. His 13+ years of hands-on experience with Sage products and enhancements have enabled him to jump in from day one and start making an impact at Oasis. “I’m very excited to be joining a team of like-minded, motivated, talented individuals whose main focus is on the customer! It’s great to be at a company with workflow processes and procedures to ensure projects and task are handled in a timely, efficient manner.” Senior Consultant Scottie Blackmon. Since 1991, Oasis Solutions has been serving businesses throughout North America with software consulting, development, training, and support. Oasis is an award-winning business management software partner for Sage software, NetSuite, and Adaptive Insights. Oasis has been around since before technology was a buzzword, assisting businesses in assessing, attaining and supporting business management software. With more than 300 years of combined industry experience, our team of software specialists offer expertise in accounting, human resource management, and custom software development. Oasis Solutions has offices in Louisville and Lexington, KY, and Nashville, TN. It’s Not Just What We Bring To The Table, It’s Who.